Gateway Pundit Blogger Arrested In Scuffle With Woman At His "It's OK To Be White" Campus Speech - Joe.My.God. A controversial far-right reporter was arrested Tuesday night following an altercation at a University of Connecticut event where he was speaking, a university spokesperson said. Lucian Wintrich, 29, the White House correspondent for the conservative website The Gateway Pundit, had been giving a speech advertised as “It Is OK To Be White” when a woman approached his lectern and took some papers off of it. The Gateway Pundit is calling the woman a “commie.” Sure. For those unaware, the homocon-run Gateway Pundit is perhaps the nation’s most infamous fake news site and regularly posts hoaxes and wild claims which are quickly debunked. 1. Stealing people’s notes is dumb and bad. 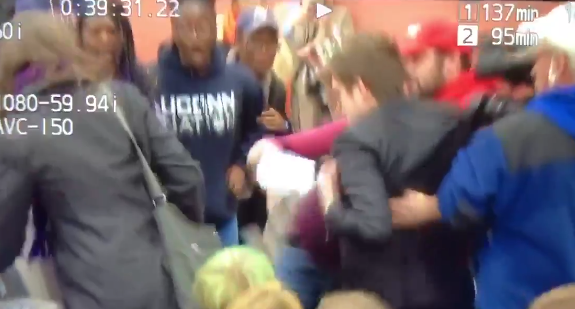 It’s really unfortunate that some of the kids at @UConn felt the need to be violent and disruptive during a speech that focused on how the leftist media is turning Americans against each other. Tonight proved my point.